For over 50 years, the practice of plant tissue sampling has been used to determine the status of nutrients in crops. More recently, there has been a movement to use tissue sampling to determine “hidden deficiencies” in the crop. While tissue analysis represents just one tool in the toolbox for managing nutrients and should be viewed like a report card, it can provide useful information in diagnosing problems when done properly. Here are the 4 things you need to make the most out of tissue analysis. The best results come from collecting multiple samples within a field to compare the results. Multiple sampling areas in the field with similar hybrid or variety can help better diagnose issues, so get samples of the good, the bad and the ugly. Collect soil samples as well to aid in determining next steps. Just be sure to avoid diseased or damaged plants as they can throw off results. Nutrient sufficiency ranges are targeted to specific parts of the plant, sampled at specific times, so if your plan is to compare results to these ranges, refer to your lab for accurate placement and timing of the sample. Avoid sampling at early growth stages, as early season stress can result in poor uptake of nutrients and skew results. Plants do not require large quantities of nutrients early in their growth so deficiencies are more likely the result of early season conditions and will go away as soils warm and the plant starts to grow rapidly. The critical time for rapid growth starter fertilizer in corn is near the V5 stage, so it’s not surprising to see deficiencies pre-V5. The uptake of one nutrient in the plant is not mutually exclusive to the uptake of other nutrients. For example, phosphorus deficiency commonly affects plant growth, including the expansion of roots in the soil. This in turn can reduce the uptake of other nutrients. Start with the nutrients that are more likely to be deficient in a specific crop. For corn and wheat, that means nitrogen, then sulfur, phosphorus and potassium. For soybean, focus on phosphorus and potassium. Remember that the idea of a nutrient sufficiency range is only a concept and can be open to a wide range of interpretations, particularly for micronutrients. 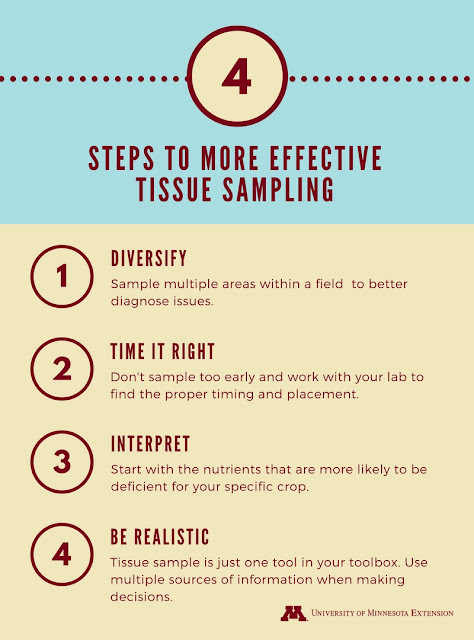 Proper interpretation of results is crucial, but is the most difficult aspect of tissue sampling. In-season nutrient applications to foliage have not shown consistent benefits for increasing grain yield of annual crops. Nutrient sufficiency ranges only provide general guidance on what should be an adequate concentration of nutrient and many plant tissue guidelines have not been calibrated to determine rates of fertilizer to apply. Always use multiple sources of information when dealing with sufficiency levels to ensure profitability when making decisions on what fertilizer to apply. Keep in mind that nutrient concentrations in a plant are not static and they can change throughout the day as a plan responds to environmental factors. 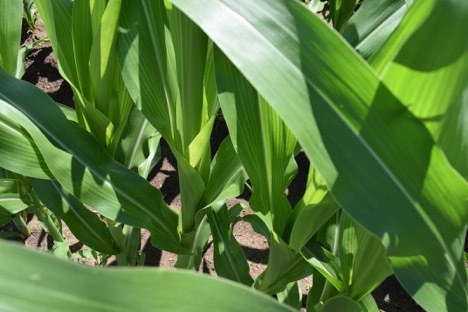 Nutrient concentrations in a specified plant part can vary by hybrid or variety, and sufficiency ranges may not have been developed based on yield response. Regardless of the limitations to plant tissue analysis, it can be a valuable tool for diagnosing problems in fields.